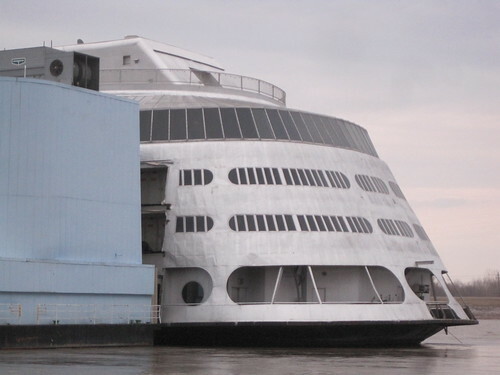 Soon the S.S. Admiral’s streamline, art moderne superstructure may be converted into cold hard cash at the going rates as high as $300 a ton. As soon as next week the old boat may be towed away to be picked apart by the skilled hands at the appropriately-named Cash’s Metal Recycling. 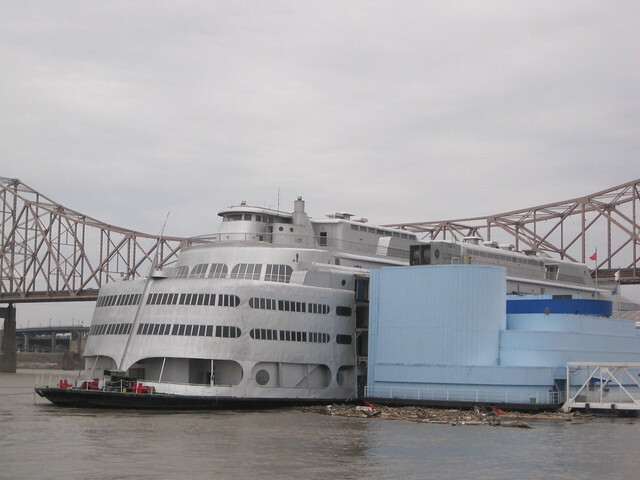 So goes the 71-year run of the city’s finest floating pleasure palace. Yet preservation circles are mostly silent on the death of one of the city’s most beloved mid-century icons. Perhaps the end of the boat has seemed like a foregone conclusion ever since its engines were removed in 1979. That act tore away the best reason to set foot upon the Admiral: being able to glide up, down and around the Mississippi River while dining, dancing, courting and sparking. The Admiral’s short life as a moored entertainment center was a bust, and its subsequent use as a casino was extended not through any great affection but by Missouri’s now-defunct loss limit law that sent Lumiere Place patrons over to keep their fix flowing. The Admiral’s once-dazzling interior had long been denuded of any of the swanky swagger of yesteryear. What was left was an artifact — a riverboat left without engines, dining room, band stand or dance floor. Of course, the S.S. Admiral was not a hopeless cause, and wild imaginations conjured future worlds in which the Admiral was pulled onshore and reclaimed with artistic license. Yet no one imagined bidding fairly on the Admiral at auction in November — not a single party. There were no last-ditch “Save the Admiral” campaigns, a fact counterbalanced by the persistent and now well-organized effort to save the earlier Goldenrod Showboat. The swell of nostalgia that saves Historic Things did not flood over the Admiral, which may have been too young and too much a part of the unpleasant present-day reality of gambling to be a fitting subject. The S.S. Admiral’s demise points to the need for continued advocacy for parts of our built past that are within our grasp. A building (or boat) young enough to be part of the lives of many people still living should be revered because it touches so many lives still being led. This entry was posted in Historic Boats, Mid-Century Modern, Riverfront. Bookmark the permalink. Many memorable moments as a child on this boat. Not the gambling boat mind you, the family friendly boat. Have to find a picture of my brother with his Levin Hat shop hat on his head riding in one of the kids motor rides. Ahhhhh, oldie but goodie days!!! I understand why a casino would want open boarding but I’d been to the Casino Queen when it still sailed and it was a blast. I also loved the skyline view from the upper deck*. I haven’t been to the new building but from what I can tell there’s not even a place to get outside and look. What a pity. I believe I’ve been in the Admiral once but unfortunately I barely remember it (not the Admiral’s fault). * I don’t know if we were supposed to go up there, since nobody ever did, but we did anyway. Sad to see the old boat go. I toured on it as a kid and a teenager. My mother would haul us there on a weekday, by bus, and we’d ride the boat, and mom would have packed a picnic of sorts. Then, the ride would end, and we would get picked up by my dad. Three of my sisters worked at the boat, selling souvenirs and popcorn. I was always envious, until I realized how hard they worked. As teens, we danced on that curved dance floor, and it was a blast. Save the Admiral? A good idea…but it’s too late. Engines gone, dance floor gone, Art Deco beauty gone…why bother. Just out of curiosity, was the Admiral segregated originally? When looking at your site I was struck with the similarity of the ADMIRAL and the A.S. Aloe Building. They both opened in 1940, It is sad, but true, that the ADMIRAL like many places in St. Louis was originally segregated. My mom and dad, both gone now, met on the Admiral in late 1944. I saw it several times from the bridge when we were visiting family in St. Louis. Life goes on and the river keeps on rolling. I HAVE SEEN THE BOAT SEVERAL TIMES WHILE THERE ON FAMILY VISITS BUT NEVER DID GET ON IT. ITS A REAL SHAME THE CITY DIDNT DO MORE TO SAVE IT OR SELL IT TO A GROUP THAT COULD USE HER OTHER THAN FOR SCRAP CASH. WHEN A TREASURE IS GONE, ITS GONE FOREVER. SHE COULD STILL BE SAVED IF YOU WERE TO HURRY, CASH TALKS.